Minimum focus is an inch shorter than most rivals at 2.62’ (0.8m) but with a 86mm filter thread and measuring 3.98 x 4.88″ (101 x 124 mm) and weighing 2.65 lb (1.2 kg) it’s as big and heavy lens. With a DxOMark score of 49 points on the Nikon D800E (we didn’t have a D810 available) the 85mm Otus is an outstanding performer. It has excellent peak sharpness equating to close to the maximum theoretically possible from the D800E sensor in the center at f2.8 and with excellent uniformity from f4 onwards. Full aperture performance is very good with practically non-existent fringing (CA) though, unusually in a lens like this, the edges are marginally sharper than the center. It’s still good, very good, and by f1.8 the center is slightly ahead of the periphery, not that you would notice in real world use. Optimum performance across the field is achieved at f4. Transmission is good at 1.7TStops and while there’s a trace of distortion in our labs there’s no real practical effect in use. 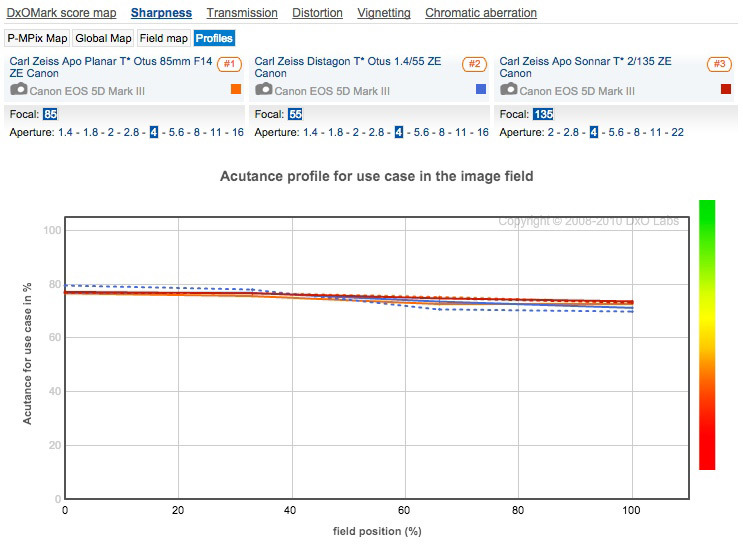 Vignetting is low, measured at -1.3EV though that is quite noticeable particularly in the extreme corners. Chromatic aberration suppression is very good at full aperture on the Nikon D800E. The best performing lens in our database is still is the 55mm Otus on the Nikon D800E but the new 85mm model isn’t far behind. 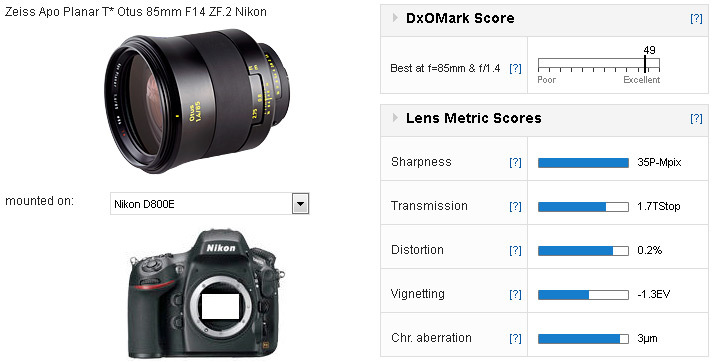 Zeiss/Nikon occupy six of the top 10 places, while Nikkor/Nikon occupy just three places and Sigma/ Nikon one. The sharpest lens in our database is a Zeiss but it’s not the new 85mm Otus, although it does come second to the firm’s Apo Sonnar 135mm f2 model. Note the 55mm Otus is in sixth place. 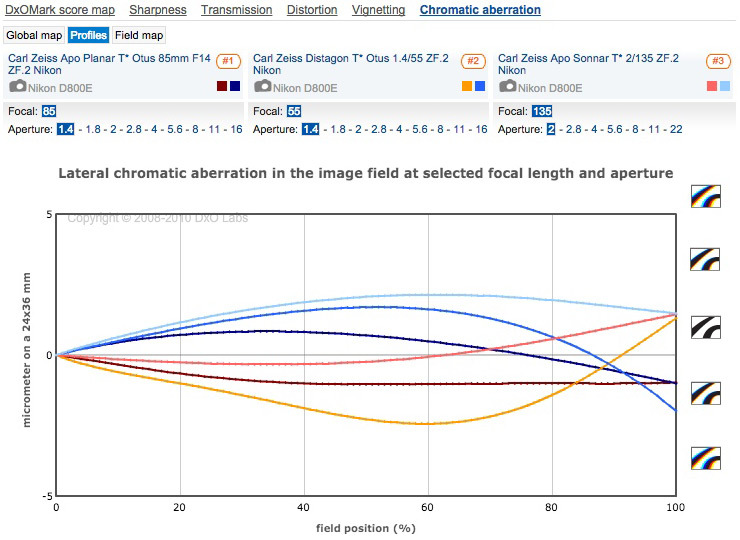 Zeiss occupy five places out of the top 10. 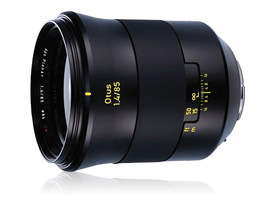 In terms of overall optical performance (not just sharpness) the original 55mm Otus remains in the number one position, but the new 85mm is in second place (albeit with a slightly higher peak sharpness). While it’s close, the original Otus has more uniform sharpness across the field. Measured on the Canon EOS 5D Mk III the ZE version behaves much the same with the obviously lower sharpness due to the lower pixel count 22.3-Mpix sensor the Canon. The sensor is a great performer and one of the most efficient but sharpness is limited by it (as it is with the Nikon D800E). 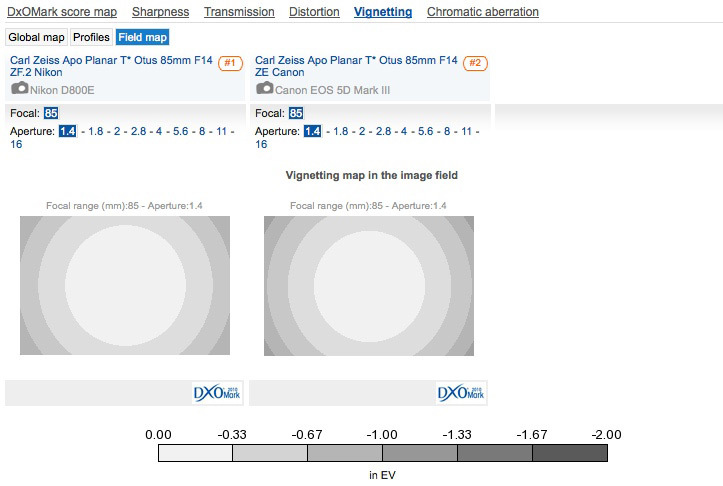 At full aperture the Nikon and Canon combination are about equal in the centers but the Nikon is sharper in the outer field. Thereafter the Nikon pair continues to offer higher sharpness (acutance) at any given aperture setting. Distortion, transmission even chromatic aberration all measured the same as the ZF.2 version (and all very well controlled), however, vignetting was a little higher mounted on the Canon. Like the Nikon D800E, the Zeiss Apo Sonnar T* 135mm is the best performing model on the Canon EOS 5D Mk III, and the new 85mm Otus comes joint second narrowly missing that top slot (though to be fair a higher resolution sensor would likely reveal greater differences between the top three models). Against the current 55mm Otus model and the Apo Sonnar 135mm, the new Otus performs very well indeed, nearly matching the overall optical performance of the former and sharpness of the latter. At full aperture the 85mm Otus is behind both the 55mm Otus and the Apo Sonnar 135mm in sharpness, at least centrally, although all three are similar in the outer field. One stop down from maximum and all three perform similarly, although the 55mm and 135mm have a slight lead in the lab, mostly in the periphery. To be fair it would be difficult to tell them apart in real world use, all three have outstanding sharpness (in excess of 80% acutance). 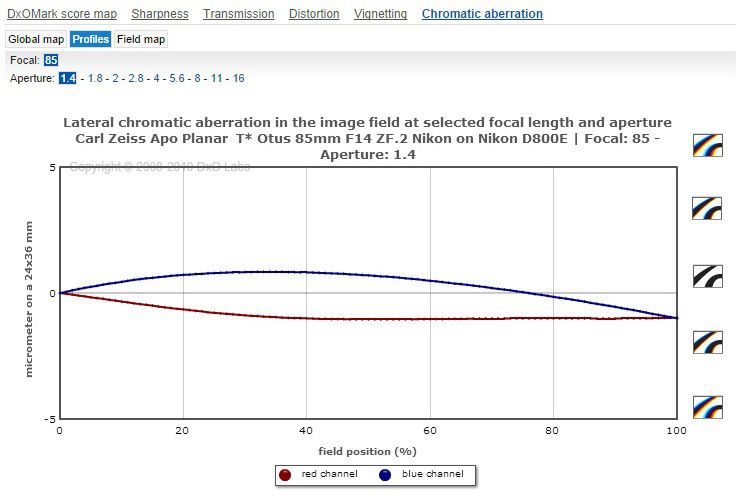 Distortion is virtually negligible between them and vignetting is least noticeable on the new model, even if the figures suggest the Apo Sonnar 135mm to be ahead. Chromatic aberration suppression is very low on all three though the new 85mm Otus is probably the best balanced across the field. The overall figures only tell so much, sometimes it’s best to look at the profiles; the new 85mm Otus is very well corrected across the field. 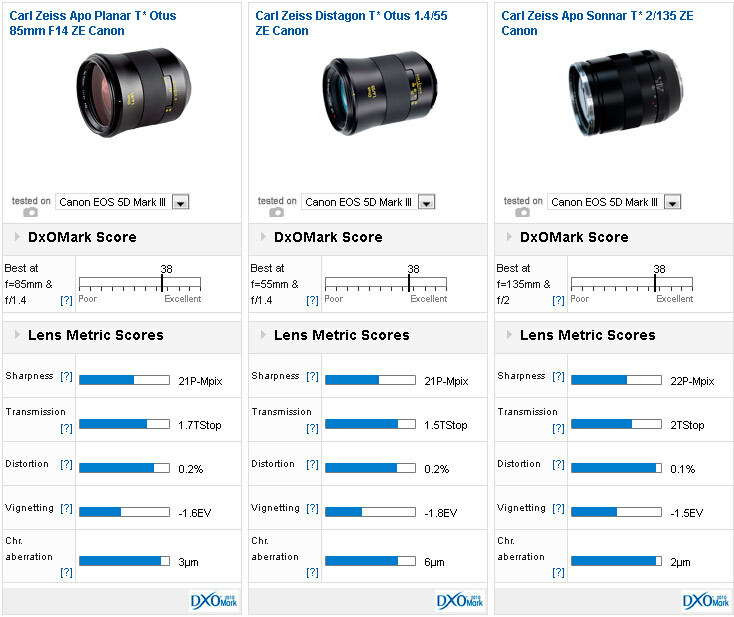 Although the DxOMark scores are lower on the Canon EOS 5D Mk III all three models perform sublimely well; sharpness is in excess of 70% and as we’ve already seen the new Otus has very consistent sharpness across the field (as indeed do the two other models). 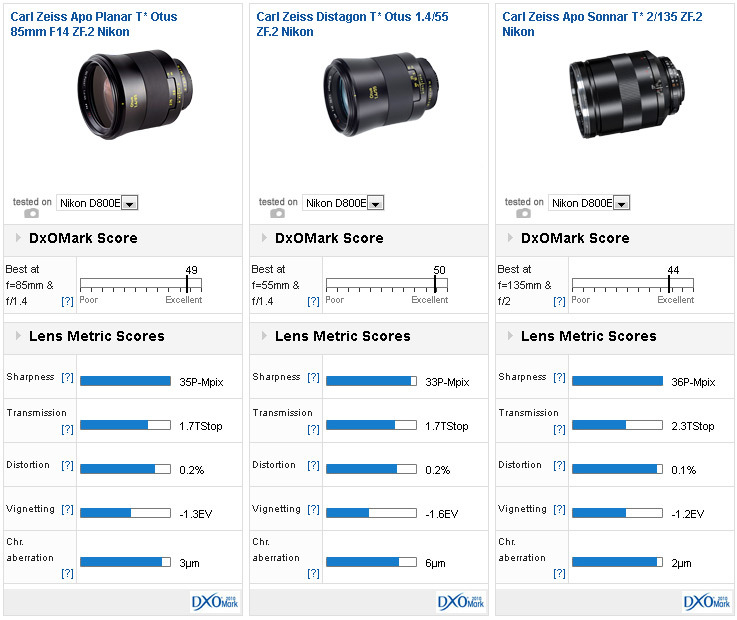 However, all three lenses are limited by the 22.3-Mpix sensor: with a higher resolution sensor we would expect significantly higher sharpness scores (and overall DxOMark scores). Be that as it may the results are spectacular; distortion, chromatic aberration and vignetting are well very controlled on all three models, and sharpness excels practically any lens from Canon (with the exception perhaps of the amazing EF 300mm f2.8L IS II USM).